Happy Print Party! Welcome me to the world of books actually IN print and win a free proof copy! So far, it’s for sale at CreateSpace and Amazon. So go buy it now! Or if you’d like to go the more economical way (or just flat out prefer ebooks like I do), check out the Kindle version. If you like it, leave me a review, please! I love hearing from readers. You can even email me your praises at michellegflye@gmail.com. All that said, how about a giveaway to celebrate? In the course of perfecting my book (and you’re still going to find editing mistakes in it, trust me! ), I went through three proofs. Proof 1 doesn’t even have page numbers, and one of the characters is misnamed (oops!). Proof 2 is pretty close to as perfect as I got it, however, I did change the back pages and my bio a bit for Proof 3. To celebrate my book’s print birthday, I’m giving away one signed copy of each proof. All you have to do is leave me a comment right here! 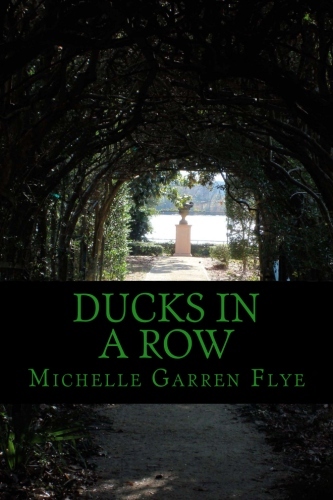 This entry was posted in Ducks in a Row, Giveaway and tagged Amazon, CreateSpace, Ducks in a Row, self-publishing by michellegflye. Bookmark the permalink.